The beauty of Life is that it is never static and you can always count on the effortless unfolding of change. The Enzo is depicted as a circle of dynamic change, manifested with one energetic brush stroke, a symbol of oneness, of wholeness, representing infinite possibilities while resonating unity. A New Era is Coming, and like the Enzo good changes are on the horizon that resonates as one with the heart of Dr. Eckert’s mission that she has forged over the years while at Laguna Center. 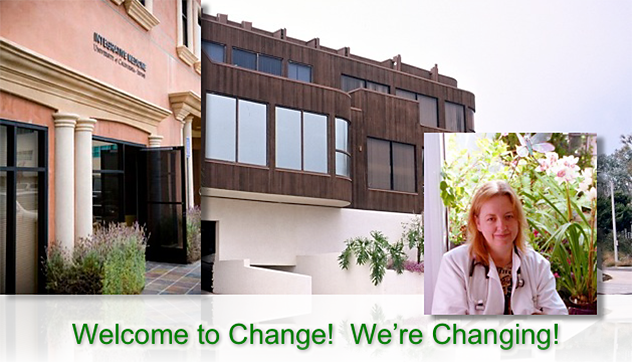 Dr. Eckert wants to Introduce to you and her clients, the Susan Samueli Center for Integrative Medicine. Dr. Robin Eckert wants to welcome you to the Susan Samueli Center for Integrative Medicine which is an academic and clinical leader in the emerging field of Integrative Medicine. Like Dr. Eckert, they combine the best of natural and complementary medicine with the best of conventional wisdom, and then they explore the boundaries of science to bring to you only the safest most effective therapies. In addition to patient care the Samueli Center is also committed to medical education, through association with U.C. Irvine, the center provides training opportunities for medical students, and medical residents interested in clinical experiences in Integrative Medicine and Medical Acupuncture as well as being a center of excellence in medical research, cultivating a future of doctors who will be embracing this new paradigm. It is exciting to see that “Integrative Medicine” has now become Academic main-stream. The Paradigm is shifting! And you are part of that change, and as the Enzo above, Laguna Center is destined to change. Aligned with Dr Eckert’s mission, the Samueli Center Staff will provide you with individualized patient-centered care, delivering therapies that are based in research, that are rational, and safe natural choices. © 2017 Dr. Robin A. Eckert, M.D.